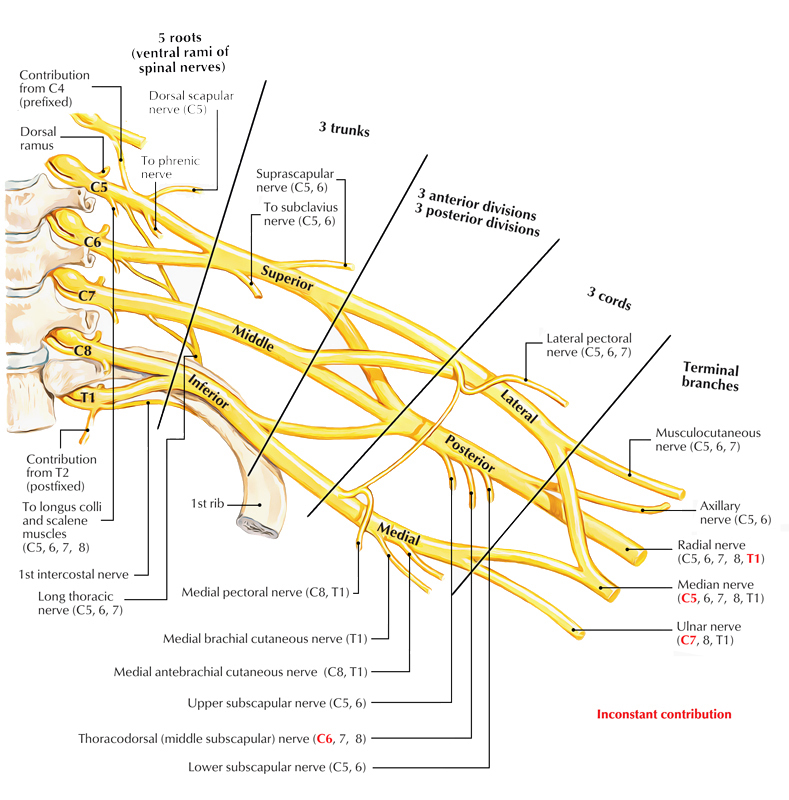 The Brachial plexus is a plexus of nerves which is made up of the C4, C5, C6, C7, C8 and T1 spinal nerves. The C4 to C8 spinal nerves are the anterior (ventral) rami of the lower four cervicals and T1 is the first thoracic nerve. The Brachial plexus supplies afferent and efferent nerve fibers to the chest, shoulder, arm and hand. The brachial plexus consists of four components: (a) roots, (b) trunks, (c) divisions, and (d) cords. The roots and trunks arc located in the neck, divisions behind the clavicle and the cords in the axilla. The roots of the brachial plexus are the anterior rami of C5 to C8, and most of T1. Close to their origin, the roots receive gray rami communicates from the sympathetic trunk. These carry postganglionic sympathetic fibres onto the roots for distribution to the periphery. The roots and trunks enter the posterior triangle of the neck by passing between the anterior scalene and middle scalene muscles and lie superior and posterior to the subclavian artery. The superior trunk is formed by the union of C5 and C6 roots. The middle trunk is a continuation of the C7 root. The inferior trunk is formed by the union of the C8 and T1 roots. The inferior trunk lies on rib I posterior to the subclavian artery; the middle and superior trunks are more superior in position. The three anterior divisions form parts of the brachial plexus that ultimately give rise to peripheral nerves associated with the anterior compartments of the arm and forearm. The three posterior divisions combine to form parts of the brachial plexus that give rise to nerves associated with the posterior compartments. No peripheral nerves originate directly from the divisions of the brachial plexus. The lateral cord results from the union of the anterior divisions of the upper and middle trunks and therefore has contributions from C5 to C7—it is positioned laterally to the second part of the axillary artery. The medial cord is medial to the second part of the axillary artery and is the continuation of the anterior division of the inferior trunk—it contains contributions from C8 and Tl. The posterior cord occurs posterior to the second part of the axillary artery and originates as the union of all three posterior divisions—it contains contributions from all roots of the brachial plexus (C5 to T1). 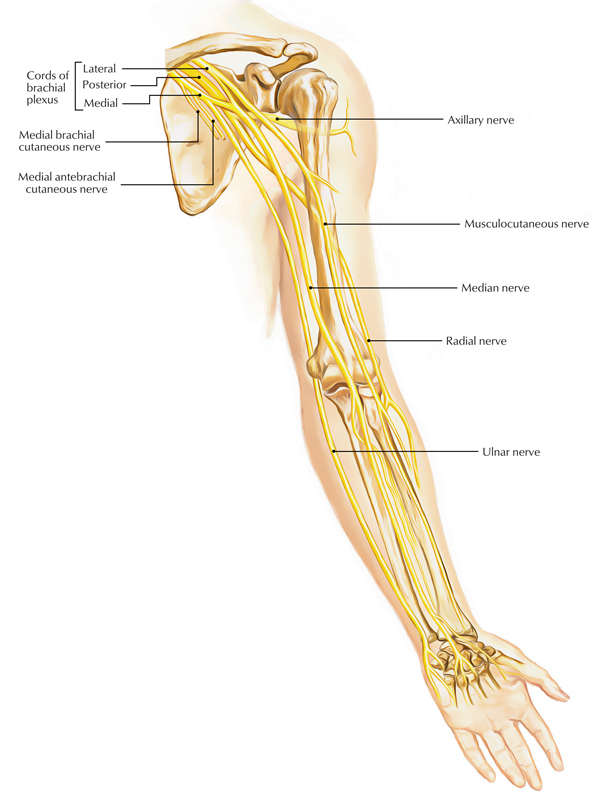 Most of the major peripheral nerves of the upper limb originate from the cords of the brachial plexus. Generally, nerves associated with the anterior compartments of the upper limb arise from the medial and lateral cords and nerves associated with the posterior compartments originate from the posterior cord. In addition to small segmental branches from C5 to C8 to muscles of the neck and a contribution of C5 to the phrenic nerve, the roots of the brachial plexus give rise to the dorsal scapular and long thoracic nerves. Originates from the C5 root of the brachial plexus. 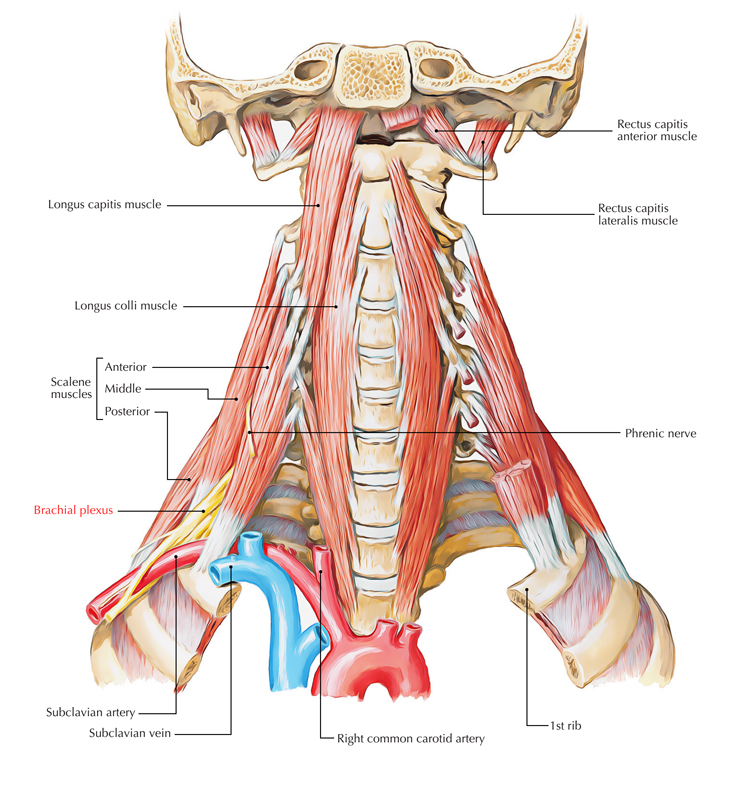 Passes posteriorly, often piercing the middle scalene muscle in the neck. To reach and travel along the medial border of the scapula and innervates the rhomboid major and minor muscles from their deep surfaces. Originates from the anterior rami of C5 to C7. Passes vertically down the neck, through the axillary inlet, and down the medial wall of the axilla to supply the serratus anterior muscle, and lies on the superficial aspect of the serratus anterior muscle. 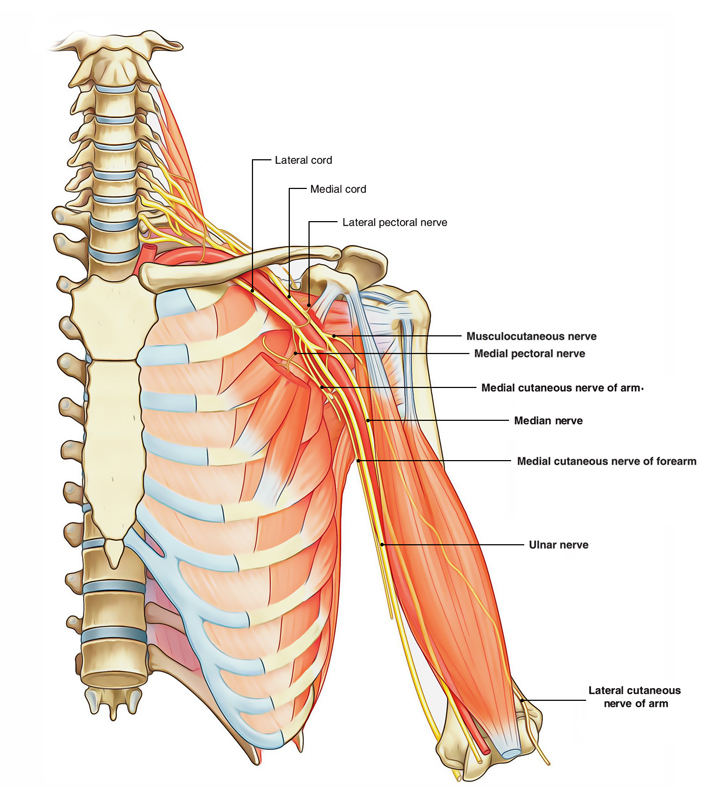 The only branches from the trunks of the brachial plexus are two nerves that originate from the superior trunk (upper trunk): the suprascapular nerve and the nerve to the subclavius muscle. is accompanied in the lateral parts of the neck and in the posterior scapular region by the suprascapular artery. Originates from the superior trunk of the brachial plexus. Passes anteroinferiorly over the subclavian artery and vein. Three nerves originate entirely or partly from the lateral cord of the brachial plexus. The lateral pectoral nerve is the most proximal of the branches from the lateral cord. It passes anteriorly, together with the thoracoacromial artery, to penetrate the clavipectoral fascia that spans the gap between the subclavius and pectoralis minor muscles, and innervates the pectoralis major muscle. The musculocutaneous nerve is a large terminal branch of the lateral cord. It passes laterally to penetrate the coracobrachialis muscle and pass between the biceps brachii and brachialis muscles in the arm, and innervates all three flexor muscles in the anterior compartment of the arm, terminating as the lateral cutaneous nerve of the forearm. The lateral root of the median nerve is the largest terminal branch of the lateral cord and passes medially to join a similar branch from the medial cord to form the median nerve. The medial cord of the brachial plexus has five branches. The medial pectoral nerve is the most proximal branch. It receives a communicating branch from the lateral pectoral nerve and then passes anteriorly between the axillary artery and axillary vein. Branches of the nerve penetrate and supply the pectoralis minor muscle. Some of these branches pass through the muscle to reach and supply the pectoralis major muscle. Other branches occasionally pass around the inferior or lateral margin of the pectoralis minor muscle to reach the pectoralis major muscle. The medial cutaneous nerve of the arm (medial brachial cutaneous nerve) passes through the axilla and into the arm where it penetrates deep fascia and supplies skin over the medial side of the distal third of the arm. In the axilla, the nerve communicates with the intercostobrachial nerve of T2. Fibers of the medial cutaneous nerve of the arm innervate the upper part of the medial surface of the arm and floor of the axilla. The medial cutaneous nerve of the forearm (medial antebrachial cutaneous nerve) originates just distal to the origin of the medial cutaneous nerve of the arm. It passes out of the axilla and into the arm where it gives off a branch to the skin over the biceps brachii muscle, and then continues down the arm to penetrate the deep fascia with the basilic vein, continuing interiorly to supply the skin over the anterior surface of the forearm. It innervates skin over the medial surface of the forearm down to the wrist. The medial root of the median nerve passes laterally to join with a similar root from the lateral cord to form the median nerve anterior to the third part of the axillary artery. The ulnar nerve is a large terminal branch of the medial cord. However, near its origin, it often receives a communicating branch from the lateral root of the median nerve originating from the lateral cord and carrying fibers from C7. The ulnar nerve passes through the arm and forearm into the hand where it innervates all intrinsic muscles of the hand (except for the three thenar muscles and the two lateral lumbrical muscles). On passing through the forearm, branches of the ulnar nerve innervate the flexor carpi ulnaris muscle and the medial half of the flexor digitorum profundus muscle. The ulnar nerve innervates skin over the palmar surface of the little finger, medial half of the ring finger, and associated palm and wrist, and the skin over the dorsal surface of the medial part of the hand. The median nerve is formed anterior to the third part of the axillary artery by the union of lateral and medial roots originating from the lateral and medial cords of the brachial plexus. It passes into the arm, anterior to the brachial artery and through the arm, into the forearm, where its branches innervate most of the muscles in the anterior compartment of the forearm. However, it does not innervate the flexor carpi ulnaris muscle and the medial half of the flexor digitorum profundus muscle, which are innervated by the ulnar nerve. the skin over the palmar surface of the lateral three and one-half digits and over the lateral side of the palm and middle of the wrist. The musculocutaneous nerve, the lateral root of the median nerve, the median nerve, the medial root of the median nerve, and the ulnar nerve form an M over the third part of the axillary artery. This feature, together with penetration of the coracobrachialis muscle by the musculocutaneous nerve, can be used to identify components of the brachial plexus in the axilla. All these nerves except the radial nerve innervate muscles associated with the posterior wall of the axilla; the radial nerve passes into the arm and forearm. The superior subscapular, thoracodorsal, and inferior subscapular nerves originate sequentially from the posterior cord and pass directly into muscles associated with the posterior axillary wall. The superior subscapular nerve is short and passes into and supplies the subscapularis muscle. The thoracodorsal nerve is the longest of these three nerves and passes vertically along the posterior axillary wall. It penetrates and innervates the latissimus dorsi muscle. The inferior subscapular nerve also passes inferiorly along the posterior axillary wall and innervates the subscapularis and teres major muscles. The axillary nerve originates from the posterior cord and passes inferiorly and laterally along the posterior wall to exit the axilla through the quadrangular space. It passes posteriorly around the surgical neck of the humerus and innervates both the deltoid and teres minor muscles. A superior lateral cutaneous nerve of the arm originates from the axillary nerve after passing through the quadrangular space and loops around the posterior margin of the deltoid muscle to innervate skin in that region. The axillary nerve is accompanied by the posterior circumflex humeral artery. The radial nerve is the largest terminal branch of the posterior cord. It passes out of the axilla and into the posterior compartment of the arm by passing through the triangular interval between the inferior border of the teres major muscle, the long head of the triceps brachii muscle, and the shaft of the humerus. It is accompanied through the triangular interval by the profunda brachii artery, which originates from the brachial artery in the anterior compartment of the arm. The radial nerve and its branches innervate all muscles in the posterior compartments of the arm and forearm, and the skin on the posterior aspect of the arm and forearm, the lower lateral surface of the arm, and the dorsal lateral surface of the hand. The posterior cutaneous nerve of the arm (posterior brachial cutaneous nerve) originates from the radial nerve in the axilla and innervates skin on the posterior surface of the arm. Adduction of the shoulder is controlled by C5 segment. Abduction of the shoulder is controlled by C6 and C7 segments. Flexion of the elbow is controlled by C5 and C6 segments. Extension of the elbow is controlled by C6 and C7 segments. Flexion of the wrist and fingers is controlled by C8 and T1 segments. Adduction of the arm due to paralysis deltoid muscle. Medial rotation of arm due to paralysis supraspinatus, infraspinatus, and teres minor muscles. Extension of the elbow, due to paralysis of biceps brachii. Pronation of forearm due to paralysis of biceps brachii. Loss of sensation (minimal) along the outer aspect of the arm due to the involvement of roots of C6 spinal nerve. Claw hand, due to paralysis of the flexors of the wrist and fingers (C6, C7, and C8), and all intrinsic muscles of the hand (C8 and T1). Loss of sensations along the medial border of the forearm and hand (T1). Horner’s syndrome, (characterized by partial ptosis, miosis, anhydrosis, and enophthalmos) due to the involvement of sympathetic fibres supplying head and neck, which leave the spinal cord through T1. The axilla is approached surgically through the skin of the floor of axilla for the excision of axillary lymph nodes to treat the cancer of the breast. The structures at risk during this procedure are intercostobrachial nerve, long thoracic nerve, thoracodorsal nerve, and thoracodorsal artery. Effort should be made to safeguard the above structures.